'Three Piece Suite' released on Redbrick Duo's debut album. Redbrick Duo's debut album features Ciarán Farrell's latest work for flute and guitar, 'Three Piece Suite', along with works by Astor Piazolla, Mark Delpriora, and Alan Thomas. The world premiere of the piece took place at Sandford Church, Dublin on the 5th of June 2015, and the official launch of their album will take place at the American Irish Historical Society in New York on the 4th of February, 2016. 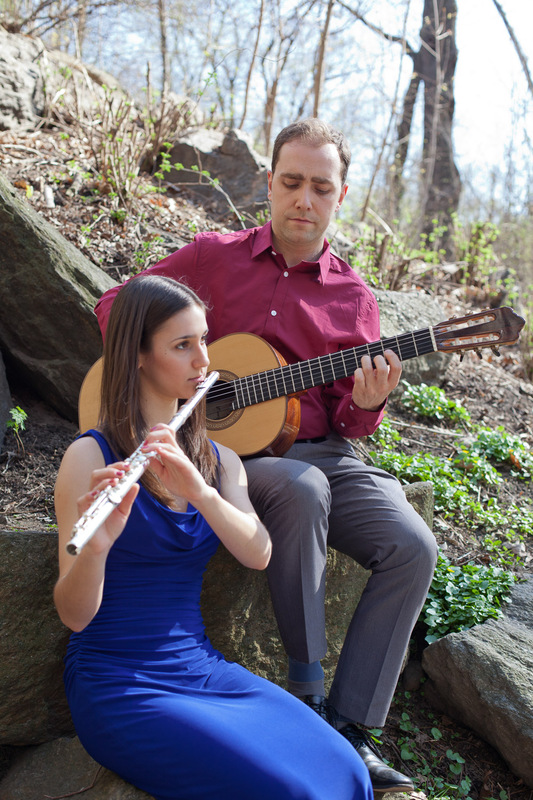 Formed in New York city themselves, having met at the Manhattan School of Music, Irish guitarist Damien Kelly and American flautist Jessica Lipstone, (Redbrick Duo), bring a fresh approach to the guitar/flute combo. Irish guitarist Damien Kelly began his guitar studies with Marion Hyland at the Royal Irish Academy of Music. He completed a BA in Applied Music at Dundalk Institute of Technology in 2009 and an MMus in performance in 2010 studying with Dr. John Feeley at the DIT Conservatory of Music. In 2014 he was awarded a scholarship by Manhattan School of Music to take part in their professional studies program, where he studied with Mark Delpriora. He has won numerous national competitions in Ireland and has also won numerous awards and scholarships from the Royal Irish Academy of Music. Damien has given solo recitals in Kings College, Cambridge, the Irish Embassy, London and the American Irish Historical Society, NYC. He has also performed at master classes given by Fabio Zanon, Manuel Barruecco, David Russell, Berta Rojas and the LA Guitar Quartet. In 2008 he played support to James Galway in the National Concert Hall, Dublin as part of the RIAM’s platform series. Damien has taught at the National University of Ireland, Maynooth, Dundalk Institute of Technology, Kilternan School of Music, Newpark Music Centre and also privately. His debut EP ‘Jolt’ in collaboration with Irish composer Ciaran Farrell went to number one in the iTunes classical charts in 2011. In 2012 he released a full album ‘New Frontiers’ under the same collaboration. Born and raised in Los Angeles, California, Jessica Lipstone began playing the flute at the age of 10. In her last few years of high school, she studied with the assistant principal flutist of the Los Angeles Philharmonic, Catherine Karoly, whom she continues to study with today. In 2014, Jessica earned her Bachelor of Music in Flute Performance at the Indiana University Jacobs School of Music, where she studied with Thomas Robertello. While attending the Jacobs School, she won the James Pellerite Flute Orchestral Excerpt Competition, as well as played principal flute in numerous orchestras and opera orchestras. She has participated in orchestras conducted by David Effron, Arthur Fagen, and Timothy Muffitt, and has worked in chamber music ensembles coached by violinist Roland Vamos and guitarist David Leisner. She is currently a Masters student at the Manhattan School of Music under the instruction of Marya Martin.